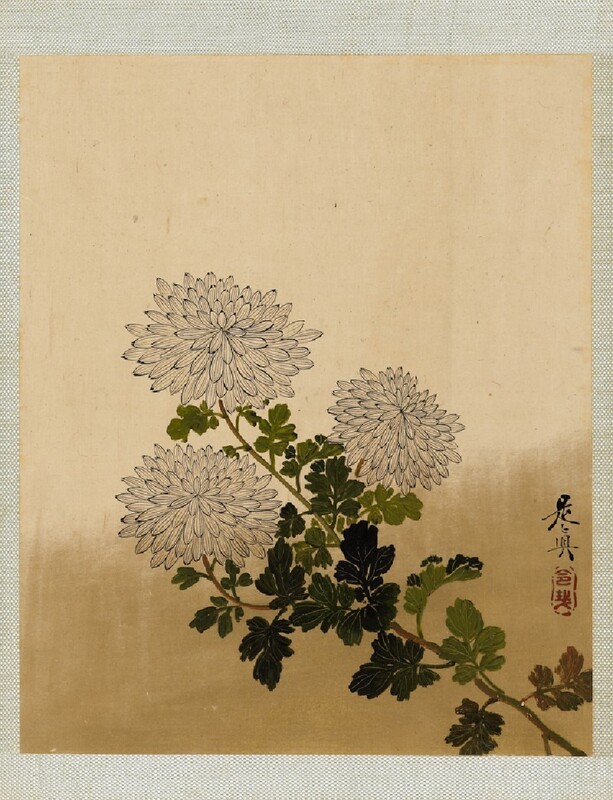 Lacquer painting on paper, Chrysanthemums by Shibata Zeshin (1807-1891). Presented by Victor Rienecker, 1966. Zeshin was an extraordinarily innovative artist who rose to fame for his participation in the great expositions of the Meiji era. 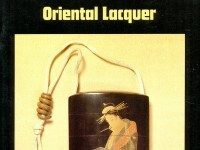 His earliest formal study beginning in 1817, was as a lacquerer apprenticed to Koma Kansai II (1766-1835). Shortly thereafter in 1822, Zeshin developed his skill as a painter under the tutelage of Suzuki Nanrei, whose comical paintings, such as that of an album reproduced in this catalogue, must have made a strong impression on Zeshin. Soon Zeshin was encouraged to move to Kyoto and began studying with	Shijō artist Okamoto Toyohiko (1773-1845), before settling in Edo. In addition to his skills as a lacquerer and painter, Zeshin was adept at haiku poetry and a practitioner of the tea ceremony. Zeshin’s long artistic career is marked by several striking innovations in lacquer technique and compositional layout. These two interests come together in the lacquer paintings, or urushi-e, of his later period. For these, he invented a method of mixing colour with a kind of lacquer that would not crack when applied to a flexible surface such as paper or silk. Here, a single stem of chrysanthemums with three flowers in full bloom juts out diagonally across the image. Several features of this work are unlike the majority of Zeshin’s other lacquer paintings. The graduated gold dust background is much less common than his well-known lacquer paintings that have a solid, overall gold background. The leaves of the chrysanthemum are more muddy and less skilfully done than those in many other lacquer paintings by the artist, and the composition lacks the type of dynamism seen in such works as an album in the Tokyo National Museum [this album is published in Itabashi Art Museum, fig. 7]. However, these differences may be explained by the presence of the seal reading 'Reisai’ of Zeshin’s earlier years. Only one other lacquer painting can be attributed to this early period [Wild Grass and Lotus, published in Link. The Art of Shibata Zeshin, 46, 53], which pushes back the date of Zeshin’s experimentation with lacquer on paper to the mid-1830s. The authenticity of Chrysanthemums will have to be determined with further study.